Miles From Tomorrowland is a children's show on Disney Junior and it's surprisingly good. 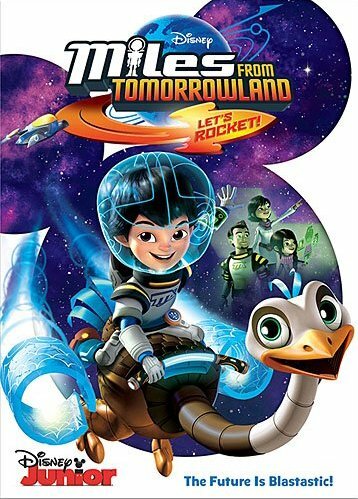 I had never seen it until recently when I received a copy of the newly released Miles from Tomorrowland - Let's Rocket DVD for review. The DVD includes either 5 or 10 episodes from the first season, depending on how you break it down. Each half-hour episode consists of two 15 minute episodes (which are actually more like 12 minutes). Overall it's about two hours of content and there are no special features but there is a cool little pack in which is a keychain flashlight that made to look like Mile's blastboard, which is like a skateboard for space. The main character of the show is a 7 year old boy named Miles who lives with his mom, dad, and sister on their spaceship. His parents are scientists and they travel around the galaxy doing sciency stuff like investigating planets or studying space phenomena. They work for an organization called the Tomorrowland Transit Authority who gives them missions which always lead to some kind of adventure. Along with his family, Miles also has a pet robotic ostrich that is also kind of a multi-tool that can fly and extend his neck and do a bunch of other stuff when the need arises. Sometimes while Miles' parents are doing whatever they need to be doing, Miles will go off on his own and explore. Other times the whole family is together and then other times Miles and his sister will be together. I like this, how they mix it up. It's not the same formula every time. I also like that they made every one of the characters smart and eager to learn. They don't rely on humor from stupidity, which can be really funny but would not quite be appropriate for a children's show who's purpose is to teach and encourage kids to want to learn. Oh, and they made Miles' mom the captain of the ship which I also thought was cool. Each adventure usually finds Miles learning a lesson and these are done in more clever ways than I would have expected. For instance, there's one episode where planets trade oceans and it taught Miles about sharing. Who would have ever thought of something so cool?! When I first got this DVD and saw that it was a Disney Junior show I was not really looking forward to watching it, but I found myself really enjoying it and wishing there were more than just 5 episodes. The pack-in blastboard is cool, but I do wish there were some extra features. I would have liked to learn a bit about the creative minds behind the show. Regardless, I don't think you'll be disappointed from this DVD.